Pierre Siellan, whom I have had the pleasrue of meeting, produces classic French style wines deep in the heart of California. He has gone toe to toe with his fellow countrymen and produced some stunning results. We first tasted the La Joie (06) at this tasting room in Napa and he then introduced us to his library wines, comprising of this 98 blockbuster. This was a real revelation, the 98 is still very enjoyable The blend of Cabernet and Merlot is the classic 70/30 as typified by the Bordelaise and this creates the great structure of tannins fruit and acidity famed throughout the world. It is an entirely different style to the more classic Napa wines such as Opus but one which is pleasing on the nose and palate. The initial nose is of strong leather and cigar boxes laced with plums and vanilla. 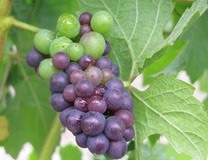 the plums from the Merlot grapes are dominant on the first nose but underlying there is a great earthy style wine. The taste is complex revealing cherry and blackcurrant with a long long finish. Hint of canned orange peel in the lingering taste. Superb.